Leave me a comment on one of my posts – that’s the best way for a quick reply! Don’t miss a post! Sign up for my newsletter! I would like to make your naan-bread today!! I have a question about the quantity of arrow root flower when substituting it for tapioca flour. Do you use the same amount of arrowroot flour as tapioca flour or arethe amounts different? Sorry for my last-minute question!! I would love to be able to make this recipe today and if you could get back to me I would really appreciate it!! Thank you so very much!! Anything else besides arrowroot or tapioca that I can use? Thank you so much for your quick response!! A masssssive thanks to your mom for sharing this genius recipe with you!!!! This naan bread is everything!! It is the real deal!! Can you give some recommendations for breakfast food? Love all the recipes I’ve tried so far! 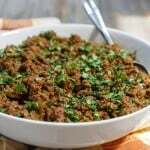 Question on crock pot cooking. I’m making the Beef Bone Broth and it’s a new crock pot. At the low level it seems to be going at a pretty fast simmer. I know it would be difficult for you to comment without seeing it but is that your experience with crock pots too? My old one at the low level would be just barely simmering and I just don’t want to overcook. The directions call for cooking for 48 hours but at this rate do you suppose 24 would be good? Pauline, some people cook their bone broth for days so I think it’ll be fine, but you may need to keep an eye on your water level. If the water goes below the bones, just add more water. The idea is to get all of the minerals/nutrients from the bones. I suggest 10-48 hours so whenever you think it’s done just strain and cool. Please let me know if you have any more questions! When your recipes call for onion, do you use white or yellow, small or large, or does it matter? Do you have any recipes for cauliflower? 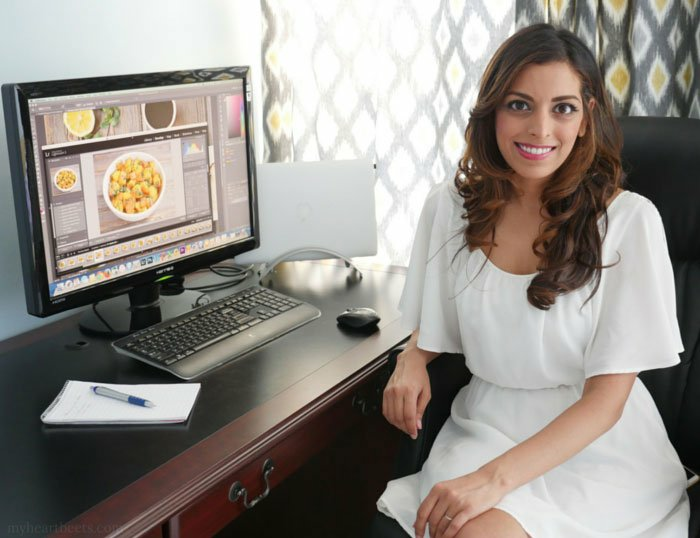 THANK YOU for providing the Indian recipes…I find myself always ‘cheating’ with the Indian food while trying to do as much good as possible with paleo. Wanted to ask your thoughts on rice. I’ve been using the cauliflower rice, but wanted to check if you had another alternative. Also, I’m writing to confirm that dals are completely out? Also, what about sabudana? I’m assuming it’s okay too, but wanted to get your expert advice. Just wanted to drop you a line and see if you would like to try our stuff. We would love to work with you in the future if you are interested. 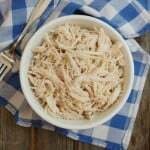 recommend a paleo Mac n Cheese recipe? I’ve seen a couple using cauliflower which sounds good, but the ‘cheese’ sauces seem a little iffy. Thank you so much for all your great recipes! I’m new too paleo and loving it. I’ve made your naan several times now and the peacha pie was really yummy! Hi Pauline! I was wondering how avocados fit into the paleo diet. I recently discovered I LOVE them! I discovered your blog with pleasure and really happy, because I love indian food, and I was really sad to let all indian’s dishes with gluten, and naan was one of these. So thanks a lot to share with us these healthies recipes! I am intolerante to dairy …do you think that ghee, even without the protein of milk, continue to be considered dairy? Sorry if my english is not correct, because I am french. My sister ( who I am no longer speaking to, lol ) brought home my favorite dessert in the whole, wide world today. Fresh, slightly warm, the scent of sweet rosewater…….I was starting to get light headed just from the smell…..Gulab Jamen. There was no way I could eat one, so she eat them for me and let me know exactly what i was missing. I wondered, is it possible to make these delicious little balls of heaven Paleo? I’m sure if it can be done, you’re the one who can do it. Thanks Ashley! I’m an American engaged to a young man (THANK you, Facebook!) from Jharkhand, and I want to be able to enjoy Indian foods with him. I plan make the traditional flatbreads for him with einkorn, an ancient wheat, to keep him from being poisoned with American FrankenWheat (viz. Wheat Belly). Now, I need a scale for spiciness: How much green chili and red chili powder do I need to put in my recipes for a mild-medium bite. I told my dear one that I will make him plenty of chutneys and pickles, if he needs more ‘heat’. Any suggestions on how to alter the ones I’ve found in such vlogs as ‘Manjula’s Kitchen’ and ‘VahRehVah’? Once again, I’m SO glad to have found your blog. So this may be a long shot, but is there any way you know / could post a recipe for Appam? I had it when I was in Chennai, and I have NEVER seen it made anywhere here in the Seattle Washington area. The way I had it was served in a bowl shape soaked in coconut milk. I have no idea if it can be made paleo but thought you might be the gal who’d know. Thanks!!! I am trying to reduce eating carbohydrates as my tri-glycerol level is double what it should be. I am a veggie, which makes things more difficult, so I was beginning to believe that the rest of my life would be miserable and that I would no longer derive any pleasure from eating! Your website is so useful and your recipes are really amazing. My husband and I are now completely addicted to having masala tea on tap thanks to your chai concentrate recipe. I thought it would be impossible to find such great tasting alternatives to roti.Thank you. You are amazing. Best wishes, Avneet. Hi Avneet! I’m so happy to have you as a reader 🙂 I have a lot of Indian vegetarian readers that have the same problem – if you haven’t yet, I highly recommend reading Dr. Sinha’s book, South Asian Health Solution. 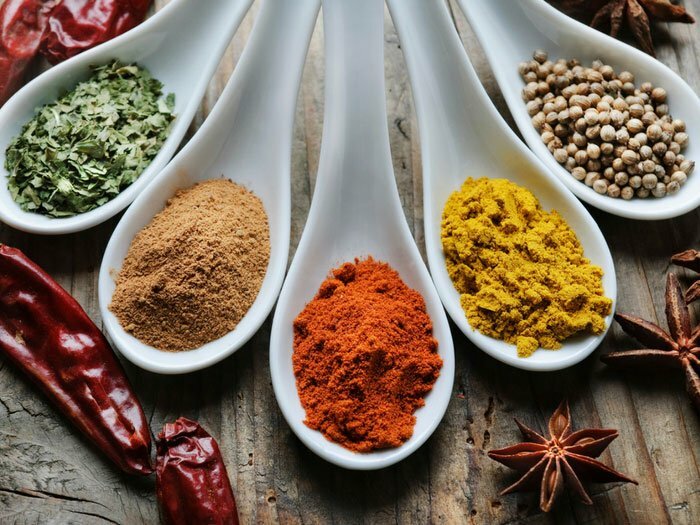 He talks about health issues that impact South Asians including how to lower triglycerides and follow more of a primal diet, even if you’re a vegetarian. Thanks again for the huge compliment, I really appreciate it! And I hope you’ll let me know how any recipes you try turn out for you! Do you have any baked paneer recipes? Thanks for letting me know, Diana. I will try to fix this! Thanks, Gabby! I’m glad to have you as a reader 🙂 As for the link, it seems to be working fine on the Real Food Resources page – can you tell me what page it’s not working on? I will try to do a search – thanks for letting me know! I just had to share this with you. We have guests coming from CA on Saturday so my sister and I have been cooking nonstop for the past two days. We made Butter Chicken ( duh) , Indian Sauerkraut, Crock Pot Bone Broth, Samosas, Thai Meatballs, Gajar Ka Halwa, Navratan Korma and Indian Pulled Pork……. I look around at everything we’ve made and say to my sister, ” We’ve been strictly paleo for 3 years now. What did we eat before “My Heart Beets”? Without missing a beat my sister answers…… “eggs”. THANK YOU, Ashley for making the paleo lifestyle sooooo delicious! I am thrilled to have discovered your recipes. Is it possible to add coconut milk from a carton instead of a can? Will it change the taste or consistency? Hi, I came across your blog while searching for paleo empanada recipes. 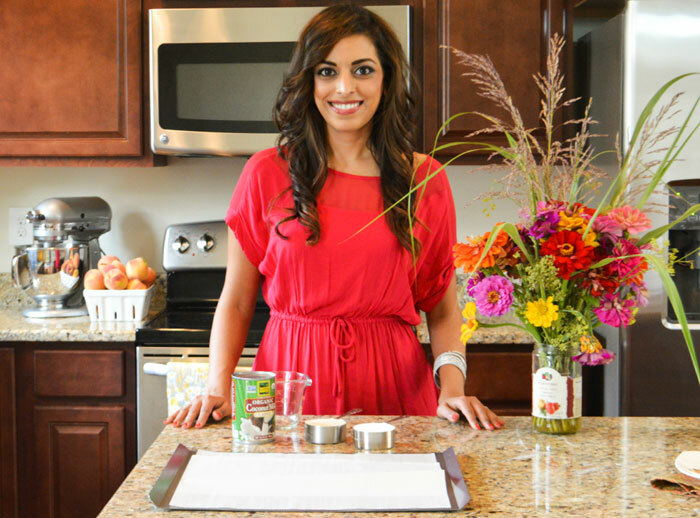 You’re one of the few people of color food bloggers and recipe developers who are also paleo! As an Asian American I appreciate that greatly as I want to eat a more grain-free diet, but frankly I get bored only making “Western” paleo dishes. Looking forward to trying your naan and samosa recipes. Louise, so glad you found my blog! And I’ll definitely keep posting ethnic recipes 🙂 Hope you’ll let me know what you think of the recipes you try! Thanks for all your great recipes. You have a beautiful family, love your pictures. 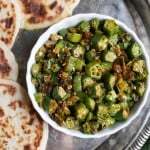 I happened to find your blog when I started eating paleo and was looking for paleo indian recipes (not so much out there), paleo naan being my favorites! I just bought your ebook, it’s got some phenomenal recipes that I can’t wait to try! Of course all your blogging tips helped a ton. Keep up the good work! Hi Sheetal! Thank you so much for the kind words – I hope you’ll let me know what recipes you like from my ebook! 🙂 Good for you for starting a blog – I can’t wait to check it out!! found your recipes and think they are amazing especially having the authentic touch and ingredients. Thank you. I love Indian food and have gone paleo which means I can’t have dahl-my favorite. Do you have a paleo dahl recipe or have you tried to come up with one? Thanks so much, Andrew! I haven’t come up with a recipe for it just yet, but trust me I’ve been trying! I’ll keep at it and hopefully there will be something soon. In the mean time, maybe give my mulligatawny soup a try? It appears that your Twitter link above is linked to someone else’s Twitter account, thought you would like to know. Aside, I’m going to try your Naan recipe:) Thanks! I absolutely love your website! and first off I just wanted to thank you so much for all the awesome and easy recipes you provide for the paleo! It can be tough but you make it so easy! I recently came across the flour called cassava flour and I was wondering if you’d heard of it or had any great recipes using it? Im considering buying the flour in bulk but since I typically use your recipes I don’t know if it would be the smartest financial decision! I was wondering if you could take a look at it and see if it’s interchangeable with some of your recipes!! Thank you so much! Thank you, Sarah!! I really appreciate the kind words 🙂 I haven’t tried using cassava flour yet, but I’m thinking of looking into it! Hi Ashley I was wondering if you could share a recipe for general tso’s chicken? That would be awesome! 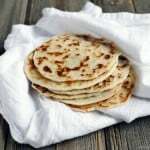 I am new to Yummly and your’s was the first site I openned (Rice Flour Roti). WOW! Thank you for sharing your recipies … I loved 99.9% of the food I eaten while visiting India for business. Most of my time was spent in Mumbai or Chennai. My gracious hosts treated me to a wonderful culinary adventure. Your recipies look awsome … I can hardly wait to work my way thru them (my unusual background included culinary school, so my Bride let’s me do most of the “experimental” cooking). Sharing bits and pieces of your Love Story is heartwarming. Your husband and you are a very handsome couple. I pray for your continued happiness and Blessings. Hi Ben! I’m so glad you found my blog 🙂 I hope you love everything that you try – and I hope you’ll let me know how the recipes turn out for you. And thank you for the well wishes/blessings! Hello this guju girl transplanted hippie 🙂 as my papa used to say! would love a gluten free dal dhokli recipe, crave my moms but wheat gets to me..have not tried your roti but looks great would that work as dholki andhold up in a dal? Thanks! Hi Nidhi! I haven’t tried making dal dhokli but I’ll add that to my list of things to try! I don’t think my current roti would work well in that recipe – I think I’ll have to come up with a new flatbread for it (maybe using besan? It’ll take some testing). I came across your website when I was googling for protein naan! I was delighted with what I saw on your wesite, God bless you! My daughter has a condition known as pcos, ibs and as you are probably aware pcos is not a very pleasant condition to have . My daughter has a pot belly due to the pcos and although I made her lose over 10 kilo’s with a low carb diet, the weight loss did not have any impact on her tummy. She is addicted to carbs and I have to literally hide stuff from her. Pcos is also associated with insulin resistance and I fear that that is one of the reasons why i am unable to get the weight off her tummy. I am Arabic but LOVE indian food due to the variety and different tastes and flavours in each and every dish. Please, would you be in a position to come up with recipes that tackle conditions such as insulin resistance and pcos? The recipes that you have on your website as just brilliant and I can easily adapt them to mt daughter’s diet. Thank you for your awesome work and please do not stop with what you are doing! I’m so glad you found my website! I would suggest finding a nutritionist who can guide you – unfortunately, I don’t know enough to help with insulin resistance/pcos but I’m here to provide allergy-friendly recipes! I hope that they will help your daughter! Hi Soleil, thank you SO much!! Your comment just made my day! So happy to hear that you love my eBook 🙂 The sardine thoran is the only way I truly love eating sardines so it makes me happy to hear that you love it too! Hello! I had a question about the chocolate paleo cake. Can I use coconut oil instead of ghee or butter? Thank you. Hi Christa! I’m sure coconut oil will work, but the cake won’t have that buttery taste. LMK how it turns out for ya! Hi Ashley, I am wondering if you have the nutritional breakdown for your Paleo Naan bread. I have made it and it is delicious, but I am wondering about the carb content. Ashley, I just want to complement you on your website! Compared to other cooking sites that I have visited, your is so easy to navigate – it’s truly a breath of fresh air! You seemed to have put a lot of love into creating it. Thanks so much! I already tried a few recipes, and they came out great. Thank you so much, Irene! It really means a lot that you noticed! I am always trying to think of how to make my blog better/easier to navigate 🙂 I’m also happy to know that you tried and liked some of my recipes! Hi Ashley – if I want to buy the eBook as a gift for someone, would I simply email the PDF eBook to her once I download it, or would I forward the download link to her? Thank you so much, Irene! 🙂 I can’t wait to hear what you think of the recipes! Hi Ashley! I purchased your book Indian Food Under Pressure, and I LOVE it!! 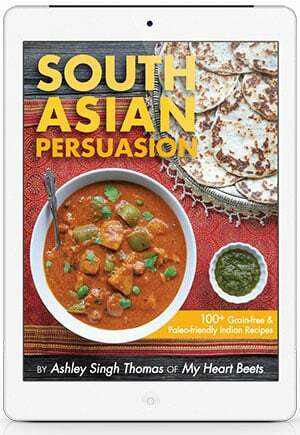 Any plans to make the South Asian Persuasion book into a hard copy? Thanks, Maneesha! I’m so happy to hear that you love it 🙂 No plans to do so yet but I’m definitely going to think about it some more – thanks for letting me know you’re interested in that! Hi, Ashley, this is just to tell you that I posted my review of Indian Food Under Pressure on Amazon today :). It’s under the name “Clara” there. I have also posted it on Librarything.com where I post all my book reviews (it’s under Clara53 there) – I thought the more publicity the better for this excellent book of yours! I just read the review, thank you!! I appreciate it so much 🙂 And I’m so happy to hear that you like the book! I don’t have an instant pot. I only have a stove top pressure cooker. 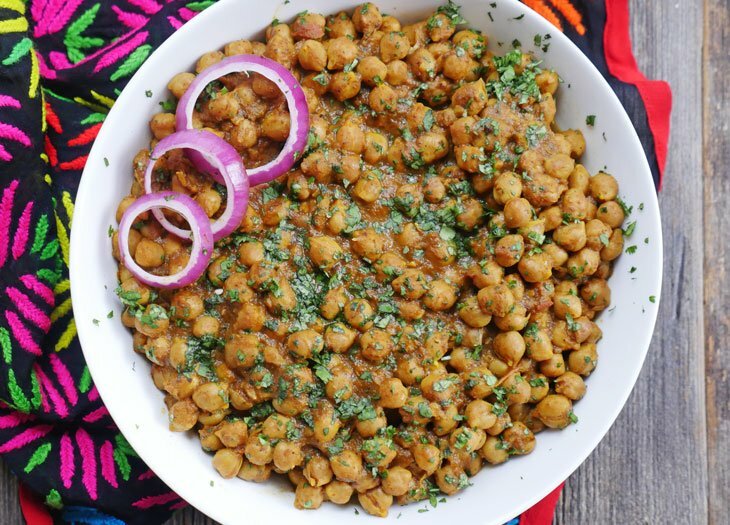 Can your recipes in Indian Food Under Pressure be substituted for the stove top? Thank you. Hi Bill, my recipes are written for an electric pressure cooker so I don’t think my book will be a good fit if you use a stovetop pressure cooker. You would have to adapt all of the recipes. Thanks for your interest! I’m so excited that I found delicious recipes using lots of clean and paleo friendly ingredients. Your dishes have been a hit at my house. Can the instant pot recipes be converted to use with a slow-cooker? I’m so happy to hear that Nooshin! And yes most recipes can be made in a slow cooker, you just may need to sauté in another pan first. I bought both your books today in ebook format but there is no link provided to download them at all. Hi Donna, the download link is supposed to appear as soon as you make the payment – sorry for the trouble! I just sent you an email with both ebooks! 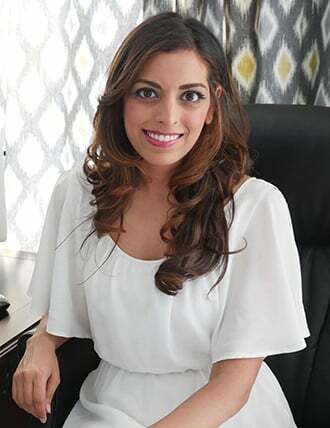 Hello i purchased your book south Asian persuasion last year but i never received the download for the book or received even a hard book copy. I was really excited to get your book as I’m unable to eat any gluten or dairy due to having epilepsy and multiple sclerosis. Please if i can still receive my book or a refund that would be great. Thank you. Hi Lacey! The eBook is supposed to show up immediately after payment – sorry for the confusion! I have emailed you a copy 🙂 Enjoy all the recipes! Hi Nancy, is the pot still able to reach pressure? If so, then it should turn out fine. I have heard that the pot will sometimes say burn even if there’s just a bit of something stuck to the bottom – but as long as it reaches pressure the end product should be good. You can also always add 1/4 cup of water if the pot isn’t able to reach pressure (just hit sauté once it’s done to boil off any water). Let me know if this works! Are all the recipes in your books also in the website? I see you have a Instant Pot recipe book with 60 recipes. Are those 60 recipes part of the 78 you have on the website? Thank you. I just ordered your cookbook. Good afternoon, the pot on pot stackable pans you recommend are no longer available on Amazon. Do you recommend any other brand? How do I get the $100 coupon off for a rotimatic and the ghee? Hi Neel, the ghee offer is over but you can still get a $100 discount by using the link in this post: https://myheartbeets.com/review-rotimatic-roti-maker/ Enjoy the Rotimatic! hey Karen, did you email me as well? If so then I think I already sent you the book but if not please send me an email at [email protected]. Thanks!! Hello there, I just purchased your new book and I put down an incorrect email. It is sappossed to be [email protected]. I forgot to put the Beth. I just purchased your e-book but have not received the email with a download link. Pls could you send it to my email address: [email protected]? Thank you. Hi Shantini, you should have received it by now (I sent an email) but if not, please let me know! Hi Irene, yes you can definitely use frozen spinach – add it in the same way 🙂 let me know what you think! Hi, Ashley, the frozen spinach (chopped frozen) worked quite well in this recipe, we loved it! 🙂 Thanks! Do you ever use asafoetida in your recipes. If yes, what kind of recipes does it tend to go in? And why do you use it (what’s the goal in terms of flavour or effect)? If no, why not? Hi Julian, I haven’t in the past because hing (asafoetida) is typically mixed with wheat and therefore not gluten-free (I am gluten-free). However, I recently sourced a great gf option so I’ll be adding it to some recipes from now on – a small pinch of it is often to lentil dishes. Hope that helps! You don’t have a Pinterest? Would love an instant pot recipe for chicken tikka masala! 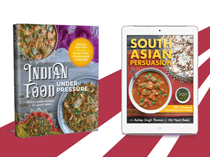 HI Ashley – I just bought your Indian Food, Under Pressure cookbook and am so excited to try all the recipes. Quick question …for your measurements are you using the measuring up that Instant Pot provides or regular measuring cups as they are slightly different. Also, I just tried making the chicken tikka rice recipe and followed it step by step (my first time using my IP) and the entire bottom of the pan burned. Any ideas why or how to fix that? Thanks so much! Geetu, I’m so happy to hear that! For measuring, I use measuring cups (not the little cup the IP comes with) I hope that helps! Am a software guys and I work at a 9-10 hour shift job. Would like to eat healthy and pack multiple lunch boxes, if necessary. How long will the recipes last in an air conditioned IT office. How to plan a lunch box, that isn’t going to spoil, which you might eat say 9-10 hours after packing? Hi Apoorv! I highly suggest you buy a mini crock pot lunch warmer – I send this to work with my husband and he loves it because it doesn’t require refrigeration or time to heat up the food. You just plug it in wherever you are 🙂 Hope that helps! Hi Ashley! I have a few South Indian recipes to request from you, I know you don’t eat a lot of rice but your recipes are so simple, easy to make, and delicious I thought your version of these dishes would be great (and accessible for me). Thank you, so enjoying your recipes and very grateful to have found you!